04.08.2012 Results for the image-based and case-base retrieval task are released. 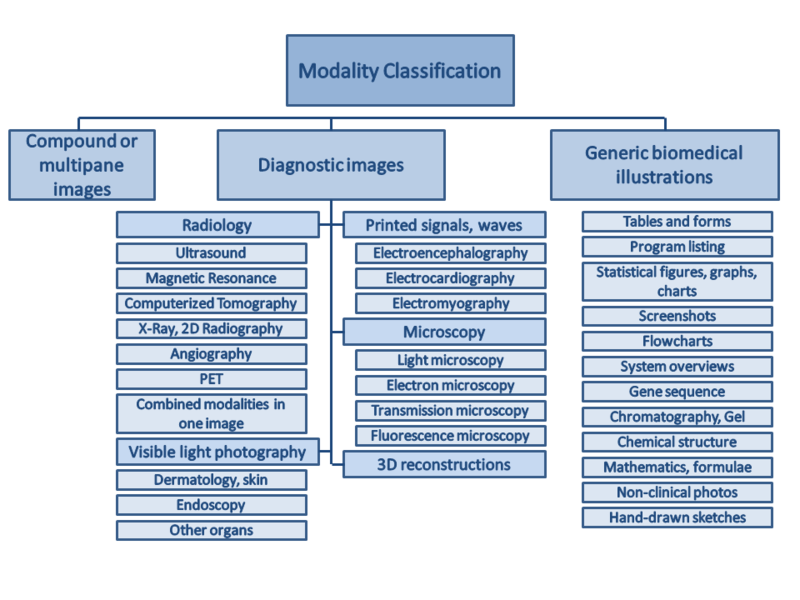 13.07.2012 Results for the modality classification task are released. 17.04.2012 Training data for the modality classification task is released. 20.03.2012 Data for the medical task is released. 15.2.2012 Registration of ImageCLEF 2012 is open. 1.12.2011 ImageCLEF is accepted as CLEF 2012 lab. The medical retrieval task of ImageCLEF 2012 uses a subset of PubMed Central containing 305,000 images. This task is a use case of the Promise network of excellence and supported by the project. Previous studies have shown that imaging modality is an important aspect of the image for medical retrieval. In user-studies, clinicians have indicated that modality is one of the most important filters that they would like to be able to limit their search by. Many image retrieval websites (Goldminer, Yottalook) allow users to limit the search results to a particular modality. However, this modality is typically extracted from the caption and is often not correct or present. Studies have shown that the modality can be extracted from the image itself using visual features. Additionally, using the modality classification, the search results can be improved significantly. This is the classic medical retrieval task, similar to those in organized in 2005-2011. Participants will be given a set of 30 textual queries with 2-3 sample images for each query. The queries will be classified into textual, mixed and semantic, based on the methods that are expected to yield the best results. This task was first introduced in 2009. This is a more complex task, but one that we believe is closer to the clinical workflow. In this task, a case description, with patient demographics, limited symptoms and test results including imaging studies, is provided (but not the final diagnosis). The goal is to retrieve cases including images that might best suit the provided case description. Unlike the ad-hoc task, the unit of retrieval here is a case, not an image. For the purposes of this task, a "case" is a PubMed ID corresponding to the journal article. In the results submissions the article DOI should be used as several articles do not have PubMed IDs nor Article URLs. The following hierarchy will be used for the modality classification, different form the classes in ImageCLEF 2011. Our database distribution includes an XML file and a compressed file containing the over 300,000 images of 75'000 articles of the biomedical open access literature. The login/password for accessing the data is not your login/password for the registration system. In the registration system under collections, details, you can find all information on accessing the data. We will provide 22 ad-hoc topics, divided into visual, mixed and semantic topic types. We will also provide 26 case-based topics, where the retrieval unit is a case, not an image. Please ensure that your submissions are compliant with the trec_eval format prior to submission. We will reject any runs that do not meet the required format. Also, please note that each group is allowed a maximum of 10 runs for image-based and case-based topics each. The qrels will be distributed among the participants, so further runs can be evaluated for the working notes papers by the participants. Do not hesitate to ask if you have questions regarding the trec_eval format. At the time of submission, the following information about each run will be requested. Please let us know if you would like clarifications on how to classify your runs. 2. Was other training data used? The first column contains the topic number. The second column is always 1. The third column is the image identifier (IRI) without the extension jpg and without any image path (or the full article DOI for the case-based topics). The fourth column is the ranking for the topic (1-1000). The fifth column is the score assigned by the system. The sixth column is the identifier for the run and should be the same in the entire file. The topic numbers should be consecutive and complete. Case-based and image-based topics have to be submitted in separate files. The score should be in decreasing order (i.e. the image at the top of the list should have a higher score than images at the bottom of the list). Up to (but not necessarily) 1000 images can be submitted for each topic. Each topic must have at least one image. Each run must be submitted in a single file. Files should be pure text files and not be zipped or otherwise compressed. The first column contains the Image-ID (IRI). This ID does not contain the file format ending and it should not represent a file path. The second column is the classcode. The third column represents the normalized score (between 0 and 1) that your system assigned to that specific result. Each specified image must be part of the collection (dataset). An Image cannot be contained more than once. At least all images of the testset must be contained in runfile, however it would be nice to have the whole dataset classified. Only known classcodes are accepted. Please note that each group is allowed a maximum of 10 runs.